S. cerevisiae, a species of budding yeast, is a convenient chassis for engineered biological systems for several reasons. It is one of the most intensively studied eukaryotic model organisms in molecular and cell biology. As a single celled organism S. cerevisiae is small with a short generation time (doubling time 1.5–2 hours at 30°C) and can be easily cultured. S. cerevisiae can be transformed allowing for either the addition of new genes or deletion through homologous recombination. Furthermore, The ability to grow S. cerevisiae as a haploid simplifies the creation of gene knockouts strains. As a eukaryote, S. cerevisiae shares the complex internal cell structure of plants and animals without the high percentage of non-coding DNA that can confound research in higher eukaryotes. As an aside, it is perhaps the most useful yeast owing to its use since ancient times in baking and brewing. Help: Want to know more about Yeast? See the help pages for more information. 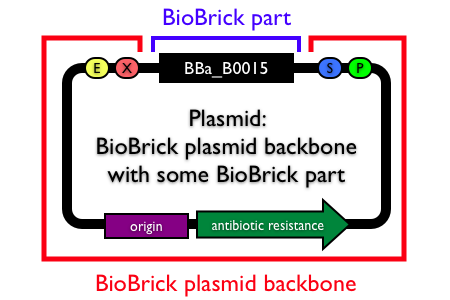 Note that most of these plasmid backbones comply with the Lim lab AarI part assembly standard. See the 2008 UCSF iGEM team wiki for more details. Sergio Peisajovich and Andrew Horowitz, from Wendell Lim's lab, developed several of the yeast plasmid backbones as an instructor of the 2008 UCSF iGEM team. All the promoters on this page are yeast promoters that are constitutive meaning that their activity is dependent on the availability of RNA polymerase holoenzyme, but is not affected by any transcriptional regulators. If you find any promoters on this page that you know to be regulated by a particular transcription factor, please let us know, or re-categorize the part yourself! All the promoters on this page are yeast promoters that are positively regulated meaning that increased levels of at least one transcription factor (other than the sigma factor) will increase the activity of these promoters. All the promoters on this page are yeast promoters that are negatively regulated meaning that increased levels of at least one transcription factor (other than the sigma factor) will decrease the activity of these promoters. This page lists yeast promoters that are Multi-regulated meaning that each promoter is either positively or negatively regulated by multiple transcription factors (other than the sigma factor). For example, a promoter negatively regulated by two repressor proteins forms the basis of a nor gate, the presence of either or both repressors is sufficient to produce a low output from the promoter. These promoters are useful if, for example, you are looking to build logic gates, or if you are looking to build a system where expression of a gene must be dependent on multiple environmental factors. A sequence logo showing the most conserved bases around the initiation codon from all human mRNAs. Yeast RBSs, more often known as Kozak sequences, are designed to be recognized by the yeast ribosome. As a eukaryotic translation signal, the sequence of yeast RBSs are distinct from prokaryotic RBSs. The registry collection of yeast RBSs is currently small, we need your help! Please contribute new yeast RBSs to the registry or provide further information about our existing yeast RBSs.